What with my main being Republic, that's the side where I decided to have a look at the new content first. I was immediately pleased to see a separate room for the story introduction, something that we haven't seen since Lost Island and something that I personally associate with the story being serious business. 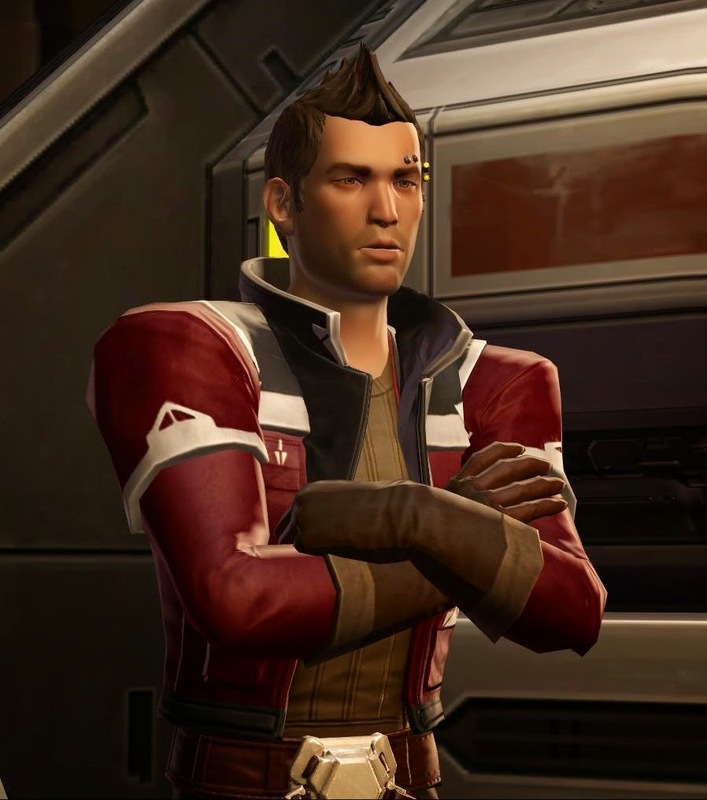 It was nice to meet Theron Shan (whom I knew from reading Annihilation) in game, even if I wish that they hadn't given him that overly gelled looking haircut. I wasn't the only one who was happy to meet him, and I rather cracked up when a straight male guildie commented that he thought Theron was "such a cutie". Since both of the new flashpoints were labelled as tactical (in other words, doable without a full trinty group and therefore easy), my pet tank and I decided to just walk in with the two of us plus companions and do it that way. For what it's worth, they actually felt reasonably challenging. Mind you, our companions' inclination to stand in bad stuff and generally low dps probably didn't help, but even so, both the trash and the boss fights seemed a lot harder than anything in Kuat or on CZ-198. 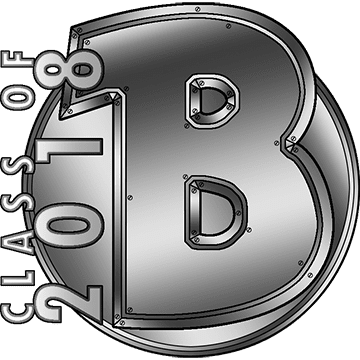 Many pulls contained a mix of strong, elite and champion mobs, and some bosses had abilities that genuinely hurt if you allowed them to catch you off-guard. I imagine that without a healer, these fights must be quite tough, kolto stations or no kolto stations. We also ran into a minor bug with a platform that appeared to be incorporeal, so you could walk through it and would fall through the floor if you tried climb it via the attached ramp. This was a little confusing as you needed to press a button on said platform to proceed inside the flashpoint, but we quickly figured out that you could reach and activate it even while standing on the ground "inside" the structure. Most of the boss fights were interesting simply because we were facing off against characters we recognised from levelling our Sith inquisitors, both quest givers and Sith instructors. The last boss, a Dark Council member I didn't recognise, was apparently a new guy though. (At least Wookieepedia says that he hadn't appeared anywhere before.) At the end a Jedi commander appeared and our characters talked to him as if he was someone they knew, but I had no memory of meeting him before (though upon re-reunning the whole thing I noticed that he was at least mentioned by name). After completing the assault on Korriban and handing in the associated mission, the inevitable news came in that Tython had come under attack and that it was up to us to reclaim it. Again we just two-manned it. Seeing the beautiful Jedi starter planet so ravaged by war was pretty heart-breaking. The bosses in there were somewhat less memorable though, except for Lord Goh at the end, whom we would later meet on Imperial side. He is extremely taciturn and pretty much never says more than a word at a time, which led to some joking around about how voice actors must charge by the word now and his monosyllabic-ness was a side effect of cost-cutting measures at Bioware. After the mission is complete and you've been praised for your hard work, Theron says that he needs a drink and asks you to meet him in the cantina. (Comment from a guildie: "Now there's something that a real person would actually say after all that happened.") He expresses suspicion about the Korriban and Tython attacks coinciding and about how the other guy we worked with seemed to show relatively little interest in the implications. He promises to look into it some more and later sends you a mail with his findings (which do not reveal much yet). You also receive a mail from another NPC commenting on the events - which NPC depends on your class - which I thought was a nice little touch. Changing to Empire side, we found ourselves invited to participate in an attack on Tython by a certain Darth Arkous and his assistant Lana Beniko. Unlike Theron, neither of them have any currently known backstory, but you could immediately tell that Lana was going to be important due to her having a unique character design and haircut. Unlike on Republic side, it's explicitly mentioned that "someone" leaked information to the Empire that enabled the assault on Tython. This time around we were accompanied by a guildie doing dps, which made things a bit faster. I was a little disappointed to find out that the attack on Tython was pretty much identical to the defense of Tython in terms of gameplay, with the bosses being simple reskins that share the exact same abilities. As a side effect of this, a fight that makes perfect sense for one faction may seem a bit random to the other. The most obvious example of this we discovered on Tython was the second boss, Master Liam Dentiri. Playing as Republic, we fought a functional Imperial clone in his place who summoned a lot of droid adds, which seemed somewhat random at the time. While fighting Master Liam as Empire on the other hand this made perfect sense, as he's the guy who gives you all those missions to fight training droids when you're levelling up a Jedi on Tython. Unlike during the attack on Korriban, Master Liam was the only familiar face we ran into while assaulting Tython. While doing a bit of reading up however, I found out that the last boss is apparently taken straight from Fatal Alliance, the one tie-in novel that I haven't bothered to read due to having heard too many bad things about it. 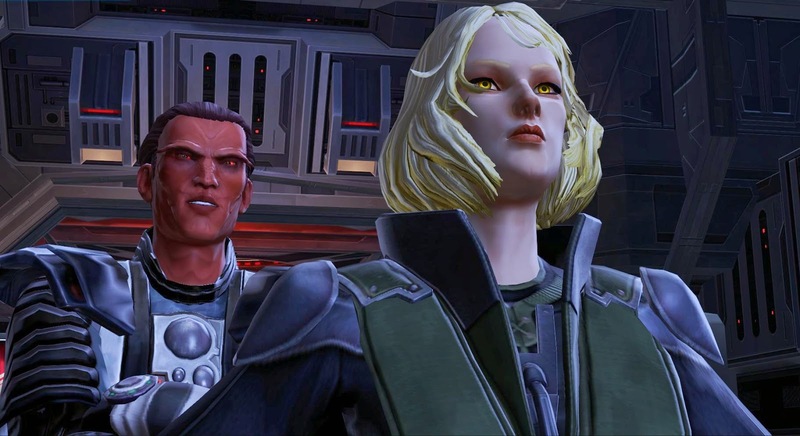 When we returned to Darth Arkous and Lana Beniko, news of the attack on Korriban came in and we were sent out yet again. Korriban was somewhat less interesting to play as Empire side, due to all the opponents being pretty much random Jedi that share the abilities of the instructors you fight on Republic side. The last boss was the aforementioned Jedi commander that appeared at the end of the Republic version. Just like Theron, Lana wants to speak to you in private after the whole ordeal, though she's more secretive about it, making sure that Darth Arkous doesn't overhear. She reveals that he definitely had ulterior motives for attacking the Jedi temple and that she feels some kind of disturbance in the Force that she suspects she's connected to. Like Theron, she sends you a mail afterwards but has to admit that she hasn't really found out anything new. I think what I liked the most about these flashpoints is that - "tactical-ness" aside - they feel like a return to what Bioware does best, telling a story. They introduce an intrigue that I can't wait to hear more about, though at the moment everything seems to point towards a third faction wanting to play havoc with both the Republic and the Empire once again. A return of the Shroud seems like an obvious possibility, but there are other options. Survivors of the Star Cabal? Who knows. Characterisation is taken more seriously and we're being introduced to NPCs that are memorable and interesting. During some of the cut scenes, Bioware used a moving camera for the first time, which feels a little odd at first but makes for some interesting shots. The last boss in each of the flashpoints actually talks to you before the fight, giving them more distinction, and the replies you can give vary depending on your class. There are also light/dark side choices to be made that actually make sense in context, in short: it's got everything that made previous flashpoints in the game unique and fun. If I had to criticise anything, it would be that they made the Republic and Empire versions of the encounters too similar, to the point where it seems a bit silly sometimes. For example it makes sense that there are Sith acolytes on Korriban when you first attack it as Republic, but encountering Jedi padawans (=reskinned acolytes) while retaking the planet on Empire side makes no sense - surely the Republic wouldn't have sent inexperienced padawans on such an important and dangerous mission. I'm also a bit disappointed that once again there is no hardmode that requires a proper trinity group, but at least the story mode is tuned to be less of a face-roll this time around. I'm still holding out hope that what I saw someone suggest somewhere else will turn out to be true, which is that Bioware might be "saving" hardmodes for Kuat and now these new flashpoints for when they raise the level cap again at the end of the year (which has been confirmed by now). While I wouldn't put it quite like that, I do agree with the sentiment somewhat. Bioware's penchant for putting story content in group activities does have it's downsides.